Basil briefing the Voyager tour party. Tour of Historic Jamestown. 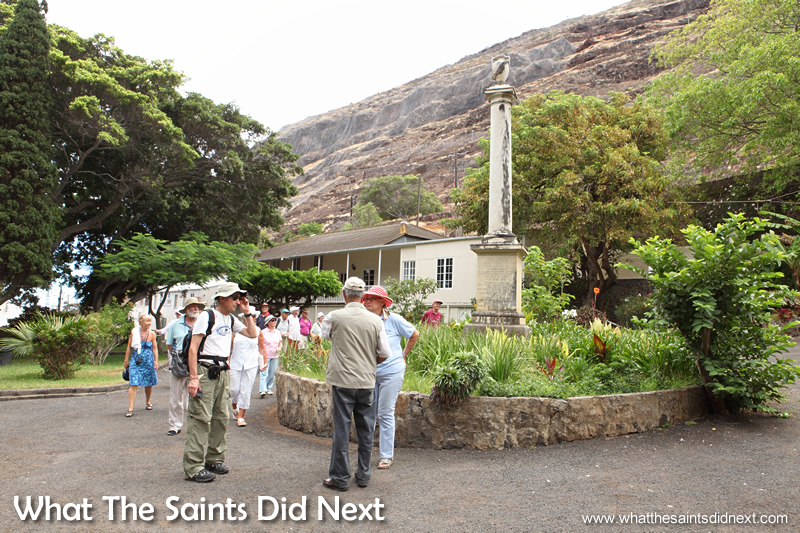 Did you know, in her heyday St Helena welcomed over 1,000 visiting ships in a year? Or, that the ‘picture’ above the Arch is the Coat of Arms of the English East India Company who colonised and governed the island from 1659 – 1834? These tasty trivia morsels are dispensed to 19 attentive passengers, fresh off the cruise ship MV Voyager that is visiting for the day. 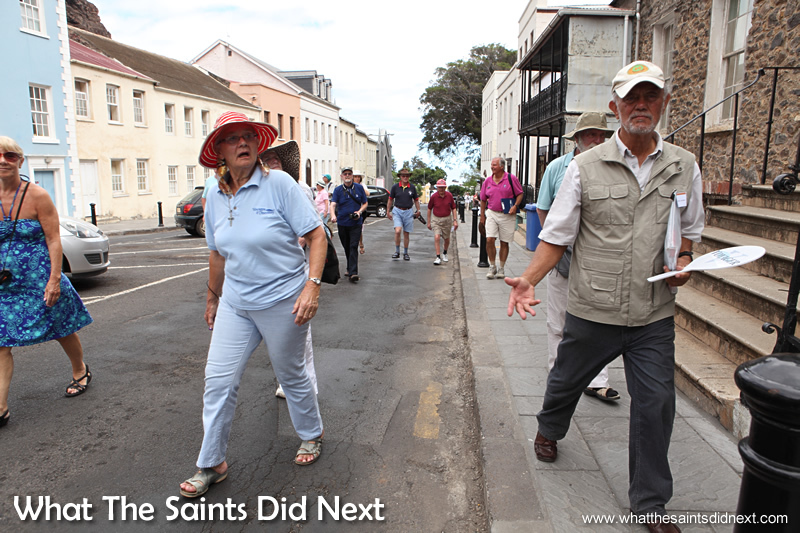 Basil George of Magma Way Tours is the guide on the historic Jamestown walk. Shading under wide brimmed hats the tour party troop behind Basil on the wharf, sea flat and glossy in the background. 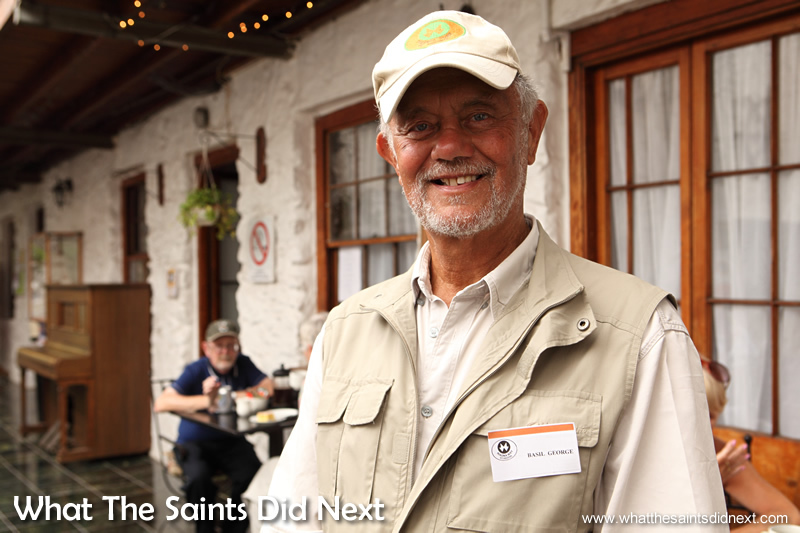 “You know, I’m the first face of St Helena that you see,” says Basil after introducing me to the party. “So anybody coming behind can only be an improvement!” Such is Basil’s humour. His happy nature is infectious and everyone soon joins in with the banter. 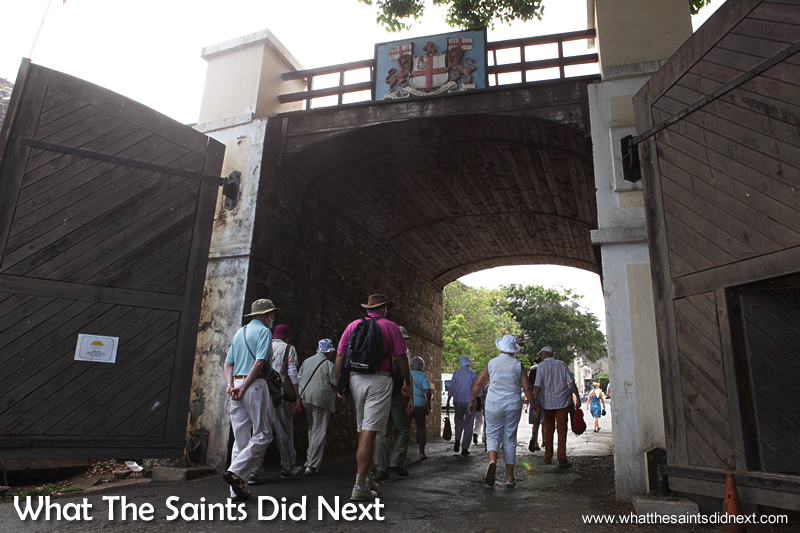 The Arch, entrance to Jamestown bearing the English East India Company’s coat of arms. Tour of Historic Jamestown. A photo op from on top of the Arch, looking on to the Grand Parade Square. 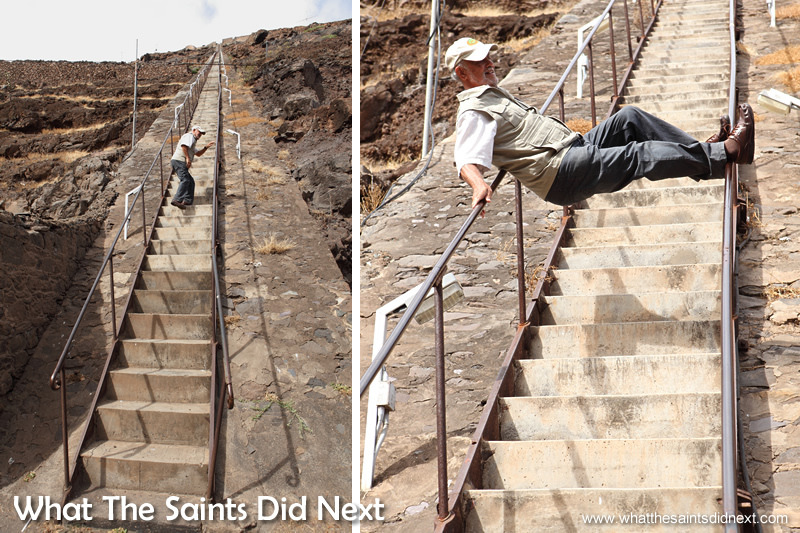 Demonstrating how people used to glide down Jacob’s Ladder in years gone by. Tour of Historic Jamestown. Basil is a self made historian and a fountain of island knowledge. Donned casually in jeans, utility vest and cap, his bright blue eyes twinkle as we move onto his favourite segment of the tour. Jacob’s Ladder a concrete stairway rising 600ft up the steep valley side has 699 steps. It was built in 1829 by Governor Charles Dallas as a funicular to connect Jamestown with the country. He runs spritely up 20 steps and spreads himself across the top of the handrails. “So you take all the weight on your back, and use your hand and foot as brakes.” Much to his audience’s delight, he smoothly slides to the base, hands squeaking from friction. On touchdown he’s treated to a round of applause. I should mention, Basil is 79 years old! The island’s court house. Tour of Historic Jamestown. The Court House is the next stop. “In 1673 King Charles II gave a Charter to St Helena,” says Basil, “it gave our ancestors full English citizenship as if they’ve been living in East Greenwich in perpetuity.” This was revoked in 1983 through the British Nationality Act 1981. 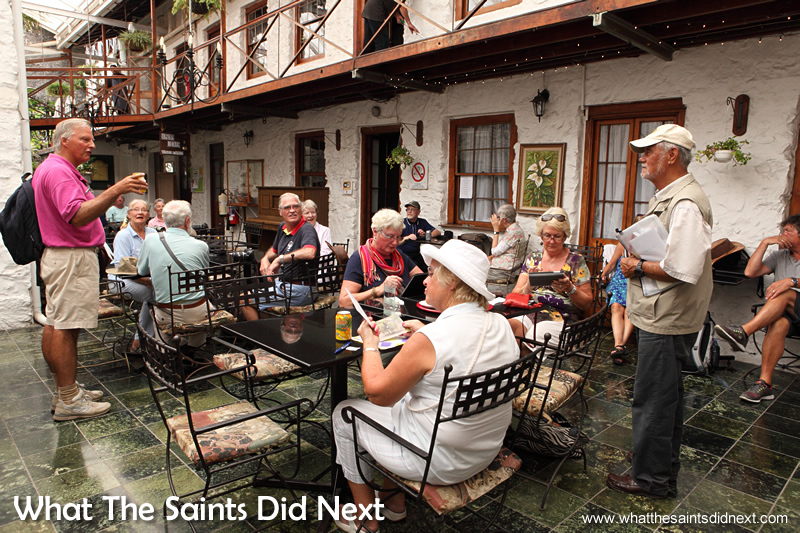 After some strong campaigning and lobbying, full citizenship was restored to St Helena in 2002 coinciding with the 500th anniversary of the island’s discovery. Inside the Castle courtyard. Tour of Historic Jamestown. Castle Garden, also referred to as the Public Gardens. Tour of Historic Jamestown. The marble monument of HM Waterwitch in the Castle Gardens is a memorial for the crew who died onboard 1839-43. 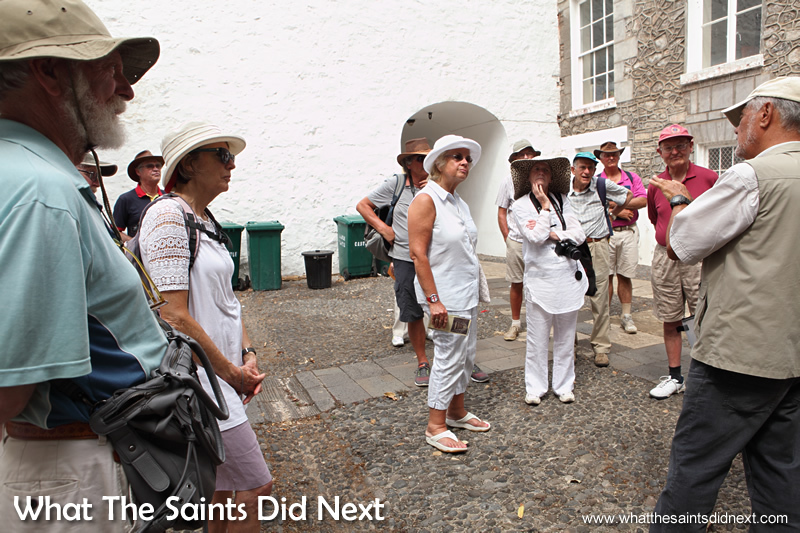 We move on to the cobbled-stone courtyard of the Castle, home to St Helena Government. Basil shouts to be heard over squawking mynah birds. “We have very good Archives here going back to 1673. Going to our racial origins, my wife traced my family tree back to some of the early settlers. My grandmother’s family has a military background and she married a Boer prisoner. Another branch goes back to one of the Chinese who stayed here, and there are three branches of slaves. That’s the mix – pot luck however you come out!” he laughs. “That’s a good gene pool,” quips a lady. 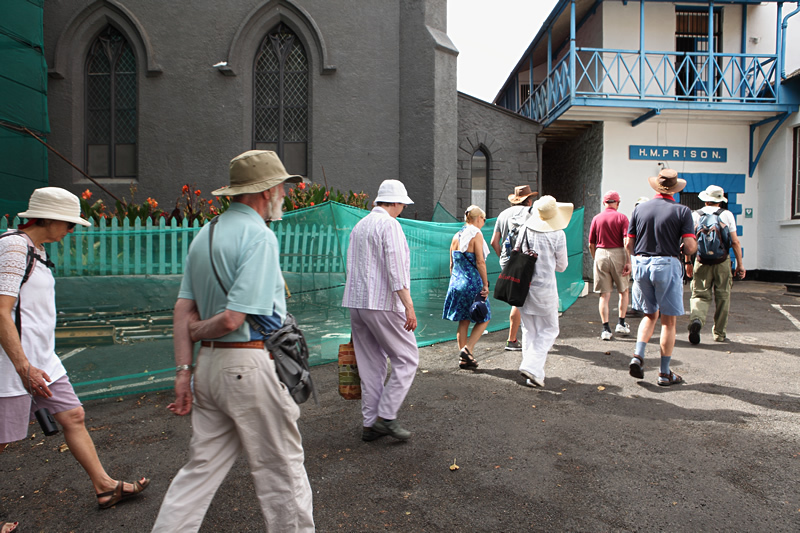 Heading for St James Church entrance, right next door to the prison. Tour of Historic Jamestown. Inside the oldest Anglican church in the southern hemisphere, St James. It’s a Sunday, so not much traffic as the party head up Main Street. Tour of Historic Jamestown. Time to write some postcards. We amble up through Main Street and cameras work overtime on the Georgian building facades. Brigadier Hugh Willing really enjoyed the walking tour of Jamestown. The tour finishes with refreshing coffee and cake at the Consulate Hotel. Magma Way Tours owner, Basil George. The tour concludes with coffee and cakes at the Consulate Hotel. Basil George, such a lovely man. 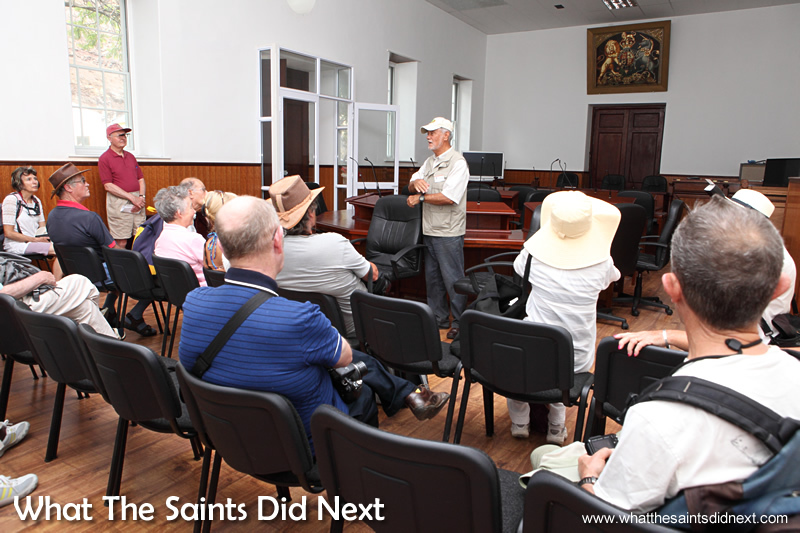 His tours are informative and fun, the best way to get to know Jamestown!! 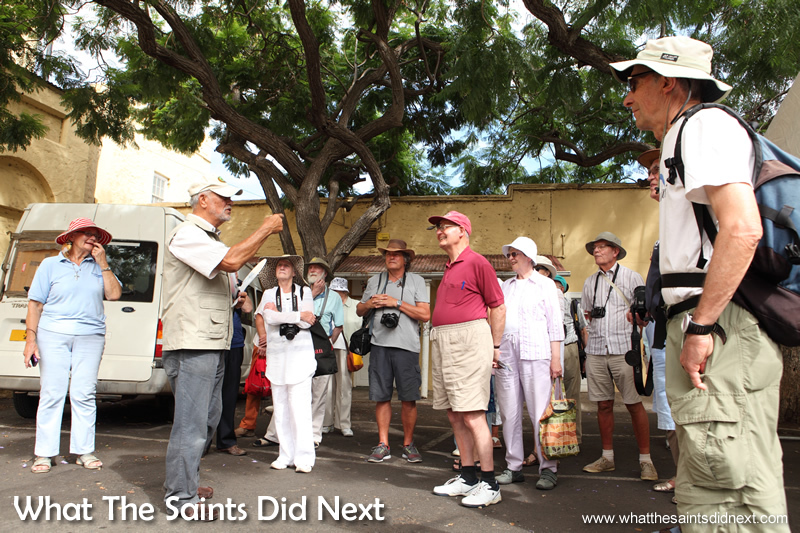 In fact all the tours I have been on on St. Helena have been great!! 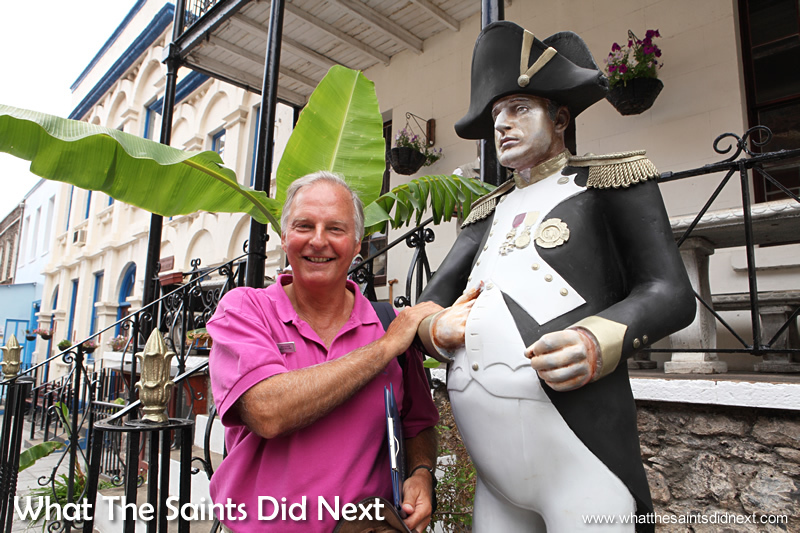 Basil is a lovely man with such infectious humour you can’t help but enjoy his tours and learn some history along the way! 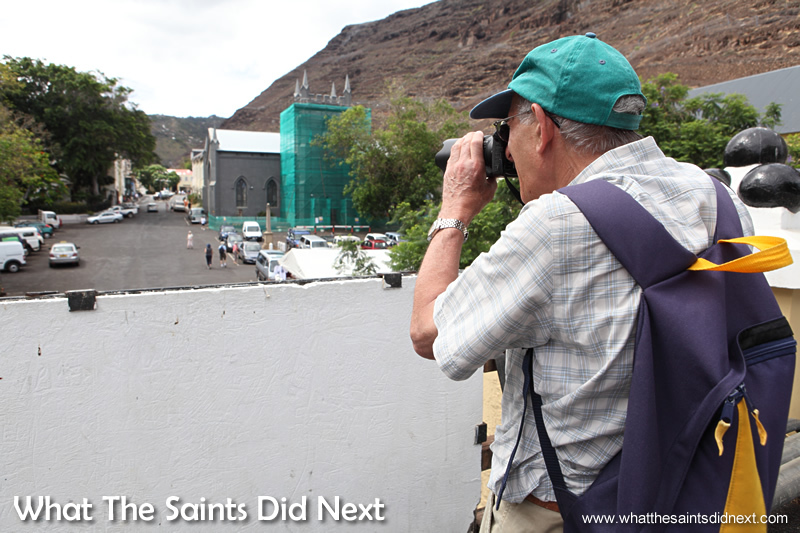 We too where on the Voyager and had a wonderful day on St Helena. I was the ‘ strange’ one in the t-shirt with my cousins Charlie and Maisie on the front! My thanks to all who spoke to me. Loads of wonderful memories. Everyone so friendly and helpful. I will be in touch and also hope to return. We like all visitors here ‘strange’ or not! Glad your trip to our island inspires you to want to return. 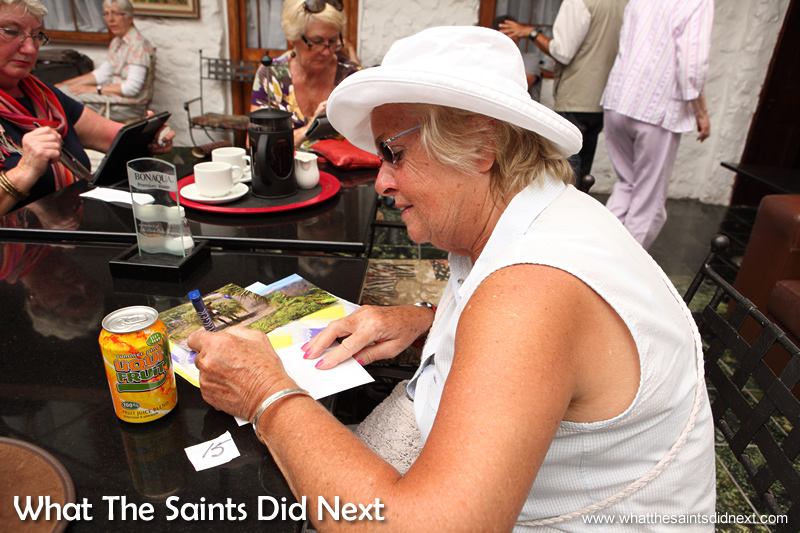 Glad your time on St Helena was so memorable. Your heart and soul will always be here when you come back! Lovely article and photos guys! We booked our trip on the Voyager nearly two years ago and it was sold out within days. 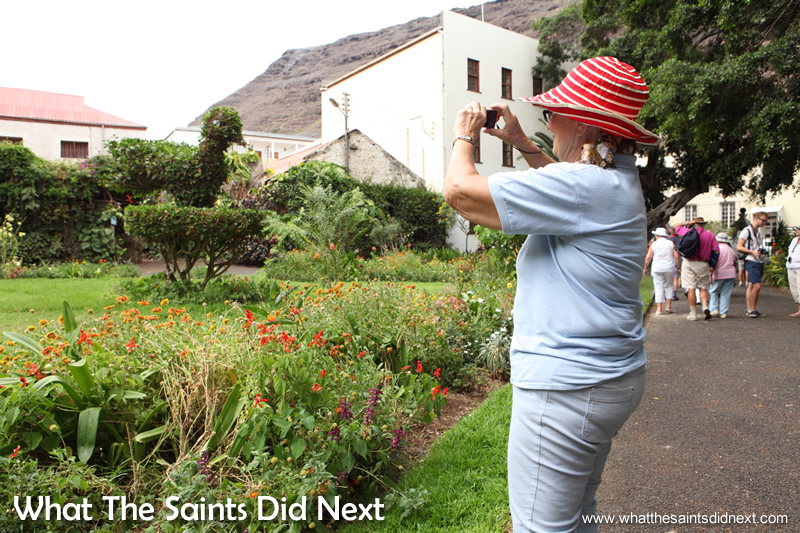 We spent a wonderful day being shown round St Helena by Pat and Darrin Henry – and what a treat it was! We finally met Sharon for tea and cake at the hotel. Thank you so much!! Your island is stunning and the memories will stay with us for ever. Brings back so many memories of our tours to the Island a few years back. Nothing seems to have changed but oh! so beautiful and impressive.